TODD CAROLAN, owner and operator of THUMBPRINT SCULPTURE STUDIO out of Pittsburgh, Pennsylvania, has some serious sculpting skills. His artistry was first discovered when he was still a child; when other kids were colouring their books, he preferred to unlock his imagination and draw. His parents nurtured this love of art by constantly bringing him to the library where he rushed to check out books in the art section, later moving into the cryptozoology section. Carolan started sculpting a decade ago when he stumbled upon a forum where other sculptors shared knowledge with each other, and credits it with teaching him about his craft. His work usually stays within the horror realm, saying “I like it when people are disturbed… and everyone likes a cool skull”. 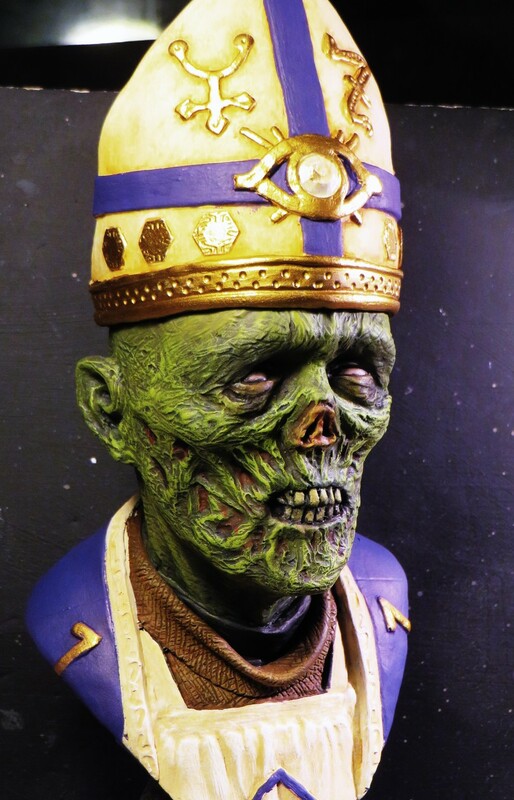 One interesting sculpture that will catch collectors’ eyes is named Warlord, a zombified Pope, which people often mistake for “Papa Emeritus” of the band Ghost. 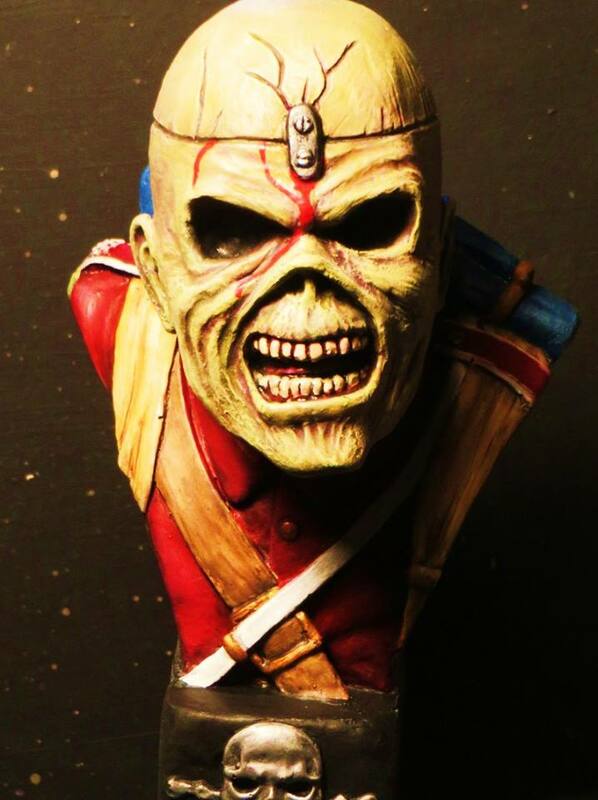 On the musical side, Carolan prefers to create renditions of Iron Maiden’s mascot Eddie. He is also partial to Alex DeLarge from A Clockwork Orange and Pumpkinhead, though he also leaves room for original characters that escape from his own mind. 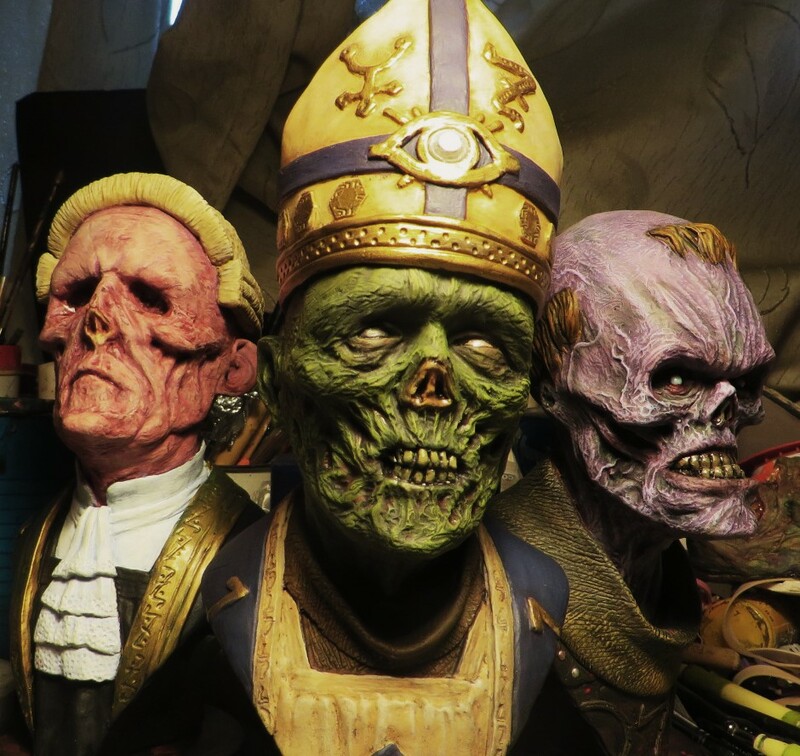 These include Minister of Justice, Warlord, and Tortus (pictured below left to right).